There is a handy Word feature that will allow you to easily pick up numbering where you previously left off. This is great for numbered lists that are interspersed with paragraphs that are formatted differently. Key in the first part of your numbered list and format it. For example, if your list has 10 items, and there is a heading after item 4, then you would enter the first four items in the numbered list. Enter the heading or paragraph that interrupts the list. Enter the rest of your numbered list and format it. The list should begin with 1 again. Right-click on the first paragraph after the list interruption to display a Context menu. 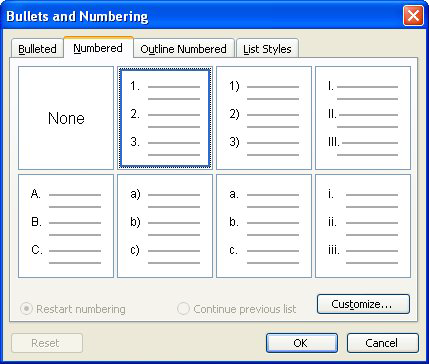 Select Bullets and Numbering from the Context menu to display the Bullets and Numbering dialog box. The Numbered tab should be selected. Select Continue Previous List at the bottom of the dialog box.